by Andy Higgs in Features, Home, Places, USA. We weren’t really ready to leave St. Petersburg after having been bowled over by the city, but we made plans to return and knew we still had plenty to look forward to on this trip. And with that we packed up the Merc and headed out onto the highway for Sanibel Island. It’s an easy and very scenic drive; the I-275 follows a narrow causeway known as the Sunshine Skyway Bridge for several miles after leaving the St. Petersburg peninsula, affording great views on both sides. We bypassed Sarasota, skirted Fort Myers and within three hours or so of leaving The Birchwood were crossing the water again over to Sanibel Island. Now we had found St. Petersburg to be laid-back, but Sanibel is something else entirely. This is definitely prime vacation territory – and vacation home territory. Sanibel and nearby Captiva attract a lot of affluent, older tourists but there’s something for everyone and it’s an excellent destination for families looking for a relaxing beach holiday. 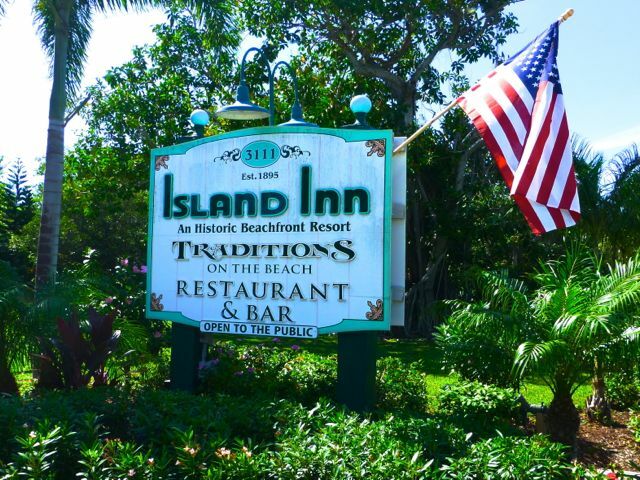 I said it was historic – the Island Inn is the oldest of its kind on Sanibel and dates back to 1895. The property has been modernized and renovated many times since then, and these days offers old-fashioned style and charm with all the amenities you would expect from a new hotel. The Inn has 49 rooms and cottages on a 10 acre plot. 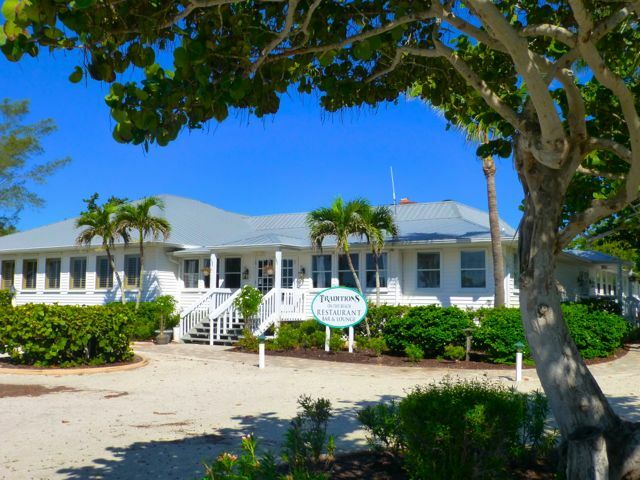 Located right on its own beach, the Island Inn is situated on the south coast of Sanibel on West Gulf Drive, one of the main roads containing a number of hotels and apartment complexes. There’s plenty of free parking on the property – our rooms were in a block a few minutes walk from reception and we could park right by our building. 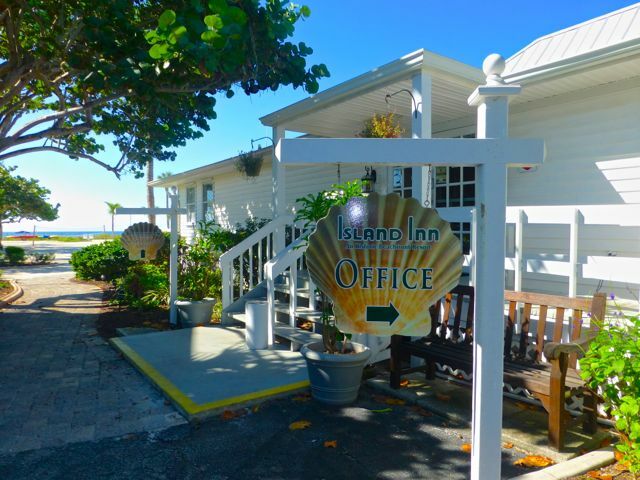 The Island Inn has a fantastic location with a lovely beach covered in shells – for which Sanibel Island is famous. 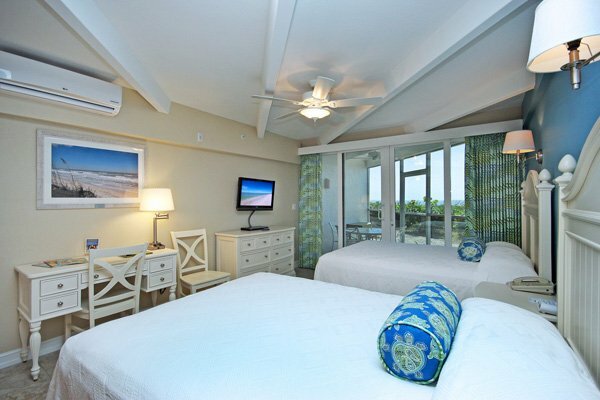 World-class shelling is actually the number one reason shellers visit the historic Island Inn. Each shell is different and the most prized are the Junonia, Alphabet Cone and Lion’s Paw. This has given rise to a condition described by the locals as the “Sanibel Stoop” – from all that bending to pick up treasure. Perhaps most of all, though, it’s a perfect place to relax, surrounded by unspoiled natural beauty. The Island Inn has old-school appeal with modern facilities and excellent, friendly service. 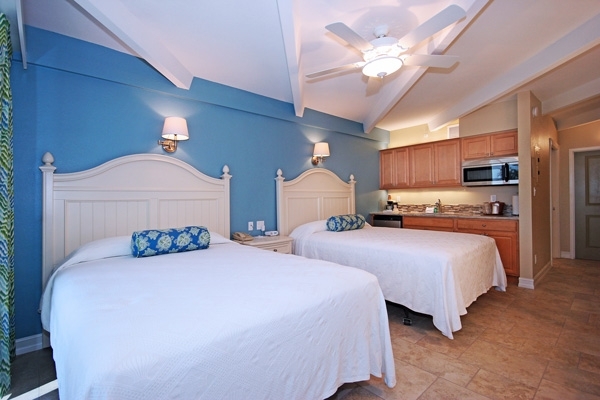 We had two similar rooms – each of which was a Kimball Lodge Gulfview Deluxe with two large double beds and plenty of space. Both also had a large and very appealing screened balcony overlooking the beach. 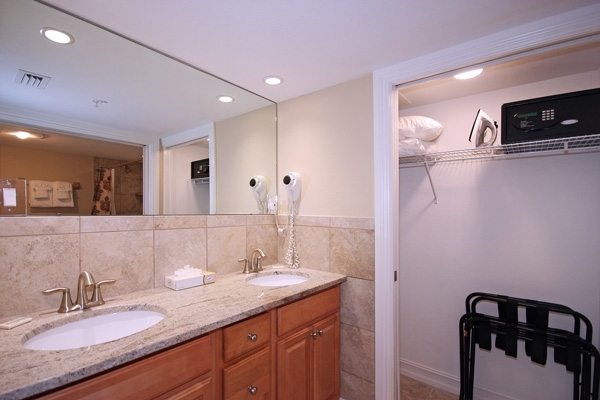 As well as being spacious and attractively decorated, the rooms are well equipped. Ours had a refrigerator, microwave and coffee making facilities and some have full kitchens. In addition we had a flat screen TV, DVD/CD player and iPhone/iPod docking station. There was a good deal of storage space and an electronic safe in the wardrobe. No – nice cool tiled floor, which was a bonus. 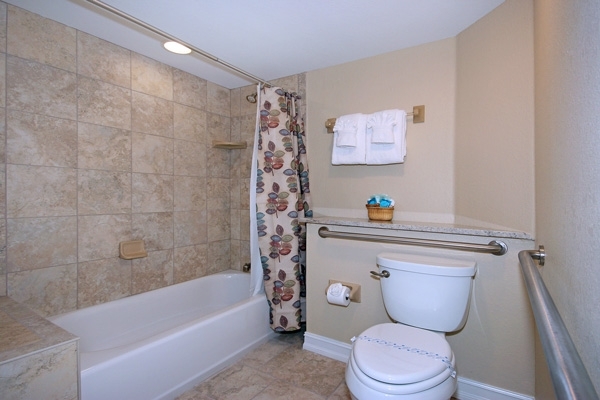 The bathrooms were also a good size and featured full bathtubs with showers too. Water pressure in the shower was very good, too. Yes, there is free and fast wireless internet access on the property and it worked very well. Traditions on the Beach is the Island Inn restaurant, bar and lounge which overlooks the Gulf of Mexico. We ate dinner here twice and both times found the food to be excellent. The style is casual fine dining and many non-residents popped in for the evening. One night also featured a band with dancing which even I lightly participated in, much to everyone else’s surprise. The Island Inn has a heated fresh-water swimming pool with a lovely beach view. The pool is open from dawn to dusk, weather permitting. Yes, a basic continental breakfast is served in the restaurant for guests. Service was excellent – all staff were friendly and helpful. No, it’s an independent hotel. Rates for the rooms we had start at USD 199 during the summer. We really enjoyed the old-fashioned, old Florida Inn style. The location is fabulous, as is the beach, restaurant and room. The only slight downside is that without a car or at least a bicycle you are a little cut off as there is nothing to buy or eat at lunchtime; so buy some supplies if you plan to stay here during the day. 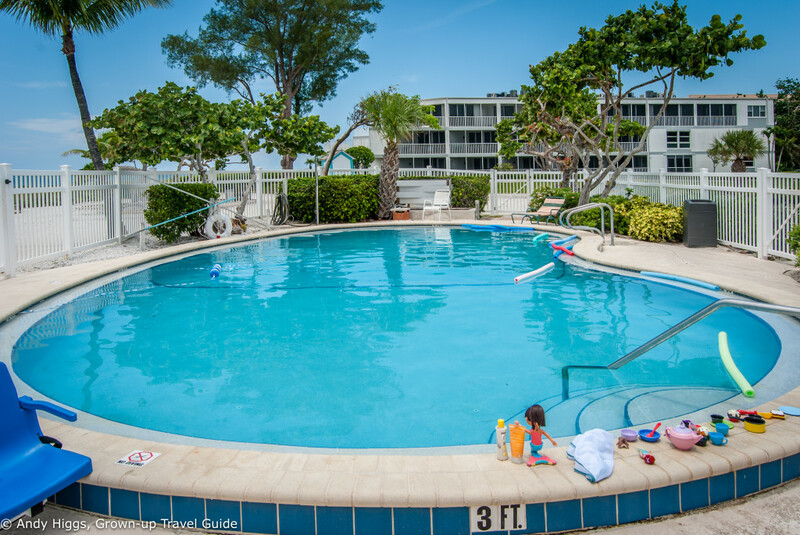 The Island Inn is an excellent choice on Sanibel Island and we loved it – and I definitely recommend you stay here when you visit..
← When is the best time to book an all-inclusive holiday?